(97) Bruce Lee & Co.
All movie posters here are originals .This website runs these items as auctions - AVOID THE WAIT - buy now at the listed price. Welcome to the auction of a absolutely guaranteed original very fine condition American 27 by 40 inch rolled 1983 one sheet movie poster for KOYAANISQATSI . 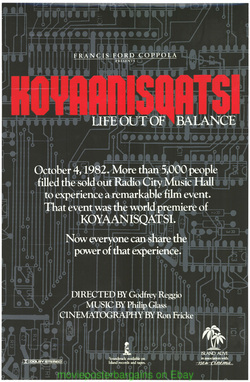 FILM REVIEW - Godfrey Reggio's magnificent documentary "Koyaanitsqatsi" was an amazing experience when it first came out more than twenty years ago. The images that are presented in the film are just beyond belief. The fantastic music score by that genius, Phillip Glass, compliments and enhances our experience. This was pioneer movie making that later on became main stream. The originality being in the way the director presents the different sections in the film with some unusual photography that, while imitated, remains the standard for comparison with any new so called latest technique and innovation. Add $5.50 for shipping IN A VERY THICK TUBE to your winning bid. No matter how many photos, lobby cards or posters you buy, (please take a look at my other auctions I run lots different auctions a week) the shipping charge total is $5.50 as long as your items can be shipped together. Posters with photos or lobby cards can be shipped together if you dont mind me putting the photos or lobby cards inside the thick tube I ship the posters in. THESE RATES ARE FOR USA AND CANADA CUSTOMERS ONLY! .All other countries add $10 to your winning bid for shipping plus $1 each for extra posters. ALMOST ALL INTERNATIONAL CUSTOMERS PAY THE WRONG SHIPPING AMOUNT FIRST---PLEASE DONT!!!. Add 8% sales tax to your winning bid if you live in California only . Mention the AUCTION ITEM NUMBER in your order as you may receive the wrong item if you don�t. For 90% of my auctions UNLESS the rates below are different - TAKE A LOOK !! - For USA customers shipping is $6.85 for USPS first class shipping or $8.35 for USPS priority shipping and a $1.35 per poster shipping charge AS LONG AS YOUR ITEMS CAN BE SHIPPED TOGETHER. Please understand if item's you buy cannot be shipped together you must pay a SEPARATE and FULL shipping charge. I know you need it fast and I ship within a week of your paying usually , if you need it faster then this I cannot accept your order because ALL MY MAIL ORDERS ARE FILLED BY A ORDER FULLFILLMENT SYSTEM AND THE TIME IT TAKES - IS THE TIME IT TAKES I am very sorry about this but this is the way it is . I CANNOT ACCEPT RUSH ORDERS PLEASE , I AM SORRY. ONE SHEETS ARE OFTEN - ESPECIALLY FOR MAJOR RELEASES - PRINTED SEVERAL TIMES WITH SMALL DIFFERENCES SOMETIMES BETWEEN PRINT RUNS PLEASE DON'T LEAVE ME BAD FEEDBACK IF THESE SMALL DIFFERENCE ARE CRUCIAL TO YOUR PURCHASE. SOME EXAMPLES -A DATE IS CHANGED AT THE BOTTOM OF THE POSTER FOR THE RELEASE OF THE INCREDIBLE HULK BUT THE ONE I SENT WAS THE OLD DATE HE DIDN'T WANT . THE SHERLOCK HOLMES I SENT WASN'T THE ONE THAT HAS HOLMES FOR THE HOLIDAY'S TAG LINE ON IT HE WANTED . I GUARANTEE THE ARTWORK MATCHES THE PHOTO BUT NOT EVERY NUANCE BETWEEN THESE VARIOUS PRINT RUNS THAT THE STUDIO'S PUT OUT - SO THE PHOTO WILL CORRECTLY MATCH THE POSTER'S ARTWORK YOU RECIEVE BUT MAY HAVE A DIFFERENCE IN THE TYPE ON IT.